Valentine's Day is coming, and that means it's time to plan a spectacular date night for you and your loved one. You could blow a fortune on drinks, dinner, flowers, and all of the trappings of commercially approved romance, or you could place a gaming spin on the evening and play a few different games. For those who wish to choose the latter option, here are five great tabletop games for two (listed in alphabetical order, not order of fun). If any of these titles catch your eye, visit your favorite local game store this weekend and stock up on games for your special Thursday night. Century: Golem Edition – This reskin of the Century: Spice Road game plays the same as the original, but I find the artwork and overall appearance of the Golem Edition far more enjoyable. The theme may be pasted on this set-collection game, but that doesn't stop it from being a lot of fun to play. Bonus: The game can support four, making it an excellent addition to couples' game night! Hero Realms – A reimagining and rework of the Star Realms deck-building game, what makes Hero Realms so very fun for me has to be the character packs that twist the gameplay slightly. The co-op adventure set also transforms the game from competitive to cooperative, just in case you like your date night just a little less cutthroat. And, again, works with four . . . maybe your date night for two should become a couples' game night this Thursday. Lord of the Rings: The Confrontation – This is more difficult to find these days, but it's well worth the effort to chase down this adaptation and reinterpretation of the classic Stratego game mechanics. This one is only for two, though, so keep that in mind when you're planning your Valentine's Day date night. Railroad Ink – This roll-n-write game is relatively new (published a few months ago), works with up to six, and is available in two different colors (Blue and Red, which can be combined). That may all make you ask: How well does this work for two? I can speak from personal experience here and am happy to report that this dice game works perfectly with two! It's a lot of fun. Star Wars: Empire vs. 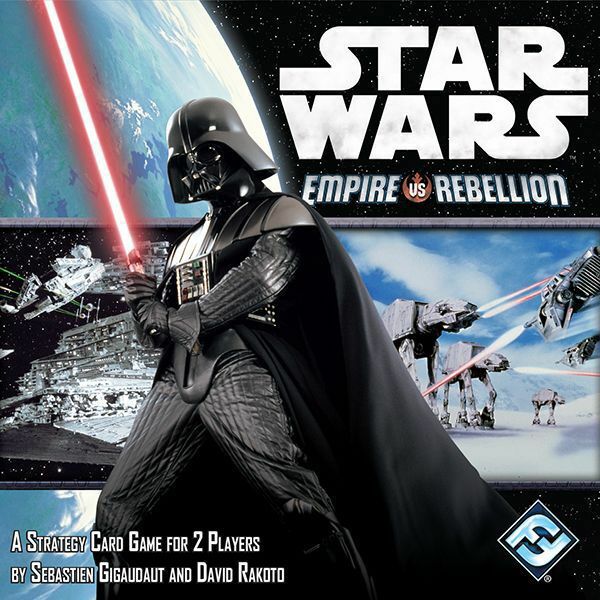 Rebellion – Here we see a re-creation of the Cold War: CIA vs. KGB game published in 2007 (and last mentioned here in 2007) and has been adapted to the Star Wars universe. This is another purely two-player game and is highly recommended. If the cold-war theme of the original interests you, Cold War: CIA vs. KGB is out there in the wild (though getting a little pricey since it's currently out-of-print). And there they are, five games to try on your Valentine's Day date night! Have you got a favorite two-player game? Please tell us all about it in the forums! There are so many games being published these days, it's not possible for any of us to keep up with everything. Working together, we can help each other find the fantastic games that we may have missed.